Want to declutter the underside of your sink and rid yourself of all those hazardous cleaners? Do you really need a separate cleaner for every surface of your home? 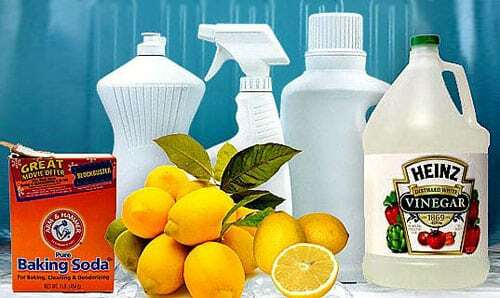 What if you could make your own homemade cleaners that are not only inexpensive but also effective? First, no, it is not necessary to have 1 cleaner for your countertops, another for your floor, another for your windows, another for your carpets, another for your upholstery, another for polishing wood, and yet 5 more to clean your bathroom. Chances are you have the ingredients in your home right now that when used alone or with another agent are capable of cleaning multiple surfaces in your home that costs next to nothing. The following is a list of common cleaners and how to make them. Window Cleaner – Combine equal parts of water, white vinegar, and rubbing alcohol. Vinegar is a natural all purpose cleaning agent, and the rubbing alcohol acts as a sterilizer as well as an evaporating agent. (It won’t leave streaks or water spots). Incidentally, once vinegar evaporates, there is no odor. Wood Furniture Polish – Combine 2 parts olive oil with 1 part lemon juice. Together these ingredients will make your wood shine and last a lifetime, and make your wood smelling citrus fresh. Room Deodorizer – Boiling a mixture of cloves and cinnamon is a great way to get your home smelling wonderful. Also, both spices have a natural odor eliminating ability versus just covering up an odor. Another recommendation is using a vanilla soaked cotton ball. Allow the cotton ball to completely absorb the vanilla and set the cotton ball in any small space you want to freshen up. Next, we’ll look at a list of common household items that have the ability to clean things you may never have guessed. White Vinegar – Vinegar, as stated above, is an all purpose cleaner. It can be used to remove dirt, soap scum, hard water stains, calcium build up, help clean clothes in the wash, and serve as a windshield washer fluid alternative. It works great on nearly any hard surface. Mix with water to dilute or keep it concentrate for more potency. Baking Soda – Use this to replace any harsh abrasive you may currently be using. Baking soda is also good in the laundry and as an overall deodorizer. Use on carpets or any surface that requires some extra scrubbing. Keep diluted or make into a paste for heavy duty jobs. For extra abrasiveness, throw some kosher salt into the mix. Club Soda – Club Soda, simply put, is an all purpose stain remover. This time tested tool can nearly remove just about any stain from any fabric. Hairspray – What? Yes, hairspray. This works well on removing ink stains from carpet and upholstery. On an unrelated note, hairspray also works wonders on preserving live Christmas trees. Hydrogen Peroxide – This was the disinfectant of old days. Well, it still does the job, and thus good not only for cuts in the skin but also killing mold and mildew around the house. Lemon Juice – Alone, this is good for polishing brass and copper. Combine with olive oil for a furniture polish and/or to prevent tarnishing. Toothpaste – Good for removing crayon marks from walls. It is also good for polishing silver and gold. By the way, did you know toothpaste makes for a fantastic acne cream? It lifts out dirt while dissolving oil under the skin. Coca-Cola and Aluminum Foil – Pour some Coke on any metal surface, particularly good on rusted surfaces, and scrub with aluminum foil. Believe it or not, your shiny metal surfaces will never gleam so bright, especially chrome. Cat Litter – If you like to tinker in the garage, you probably get messy oil spills from time to time. Cat litter works wonders on oil stains, soaking up and drying out the oil, allowing you to easily sweep up the mess. Now we have the means to clean our entire house, and we’re able to do it using cheap common items, most of which are resting idle in our pantries and closets. If there’s one more point to add it would be this: The easiest (and free) way to clean the air in your home is to open a window. Seems silly to say that, but often the simplest solutions are the ones we overlook. Airing out the house is not only good for the air but also for our mood. Happy cleaning! Thanks for the money savings cleaning solutions and for the decluttering of too many items! I have hard water. When a white film starts to build up on my glassware, I add about a cup of white vinegar to the start of the dishwasher. They come out looking brand new. I tried some of these and to my SURPRISE a couple worked better than the name brand products that cost a small fortune and pollute our enviroment. I had a pot that I cook spagg. in, well woke up hours later (had seizure) & my spagg. was black & NO Water, not even vapors of water! I tried everything to clean pot nothing worked, well read this and tried coke & foil, IT WORKED!!! so my $179.00 pot was SAVED!!!!!!!! WOW!!!! Thank you… I am familiar with many of these things but did learn some new ones! This is the most practical..informative articles yet… I’d love to hear more … just FYI… Rub Ketchup on dull brass..let sit for 5 minutes and wipe.. you will be surprised at how shiny!!! Do you know of any natural way to clean silver, so it won’t tarnish again? I’ve tried toothpaste, and it tarnishes very quickly.